Camo Plugs® are made of extra-soft, extra light foam. Their tapered shape fits easily in the ear canal and seals gently and snugly without pressure. They’re so comfortable you’ll forget you’re wearing earplugs. Good hearing is essential. When you’re in and around weapons fire, aircraft, noisy vehicles or watercraft, it’s important to protect it. Camo Plugs® from Moldex® give you the serious protection you need. 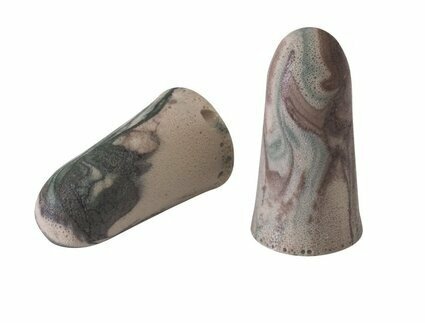 Camo Plugs® offer a high NRR 33 rating, making them suitable for most noisy environments. So, while they look like fun, they provide serious protection for serious users.